“Tibetan Tattoos, Sacred Meanings and Designs” will open your eyes, and your soul, to the most unique tattoos in the world. A Tibetan tattoo is more than just a tattoo; it is a statement of life, of peace, of hope…and a symbol of freedom. Finally, a book on Tibetan tattoos! “Tibetan Tattoos, Sacred Meanings and Designs” will open your eyes, and your soul, to the most unique tattoos in the world. A Tibetan tattoo is more than just a tattoo; it is a statement of life, of peace, of hope…and a symbol of freedom. 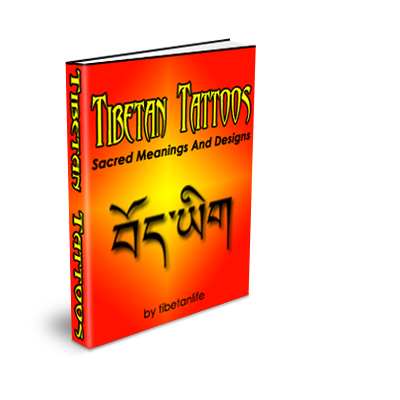 “Tibetan Tattoos, Sacred Meanings and Designs” is filled with breathtaking designs and translations of powerful Tibetan words, along with explanations of correct placement of tattoos as well as proper pronunciation of each and every word in all designs. “Tibetan Tattoos, Sacred Meanings and Designs” unlocks this profoundly meaningful world of spirituality, courage and inner truth. ༄ 108 page e-book chock full of Tibetan tattoo translations and designs. ༄ Tibetan translation is not easy to find. If you do, it costs at least $20 to get just ONE word translated.